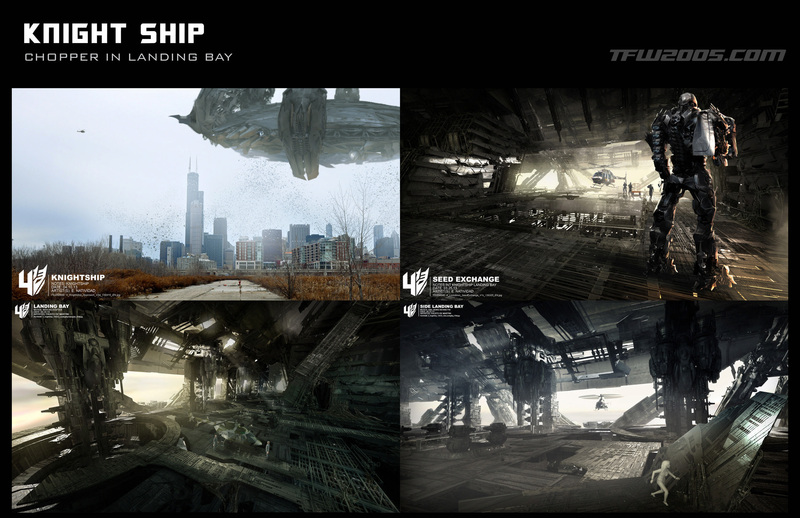 ILM has posted a video, going behind the scenes of creating the Knightship from Transformers: Age Of Extinction. News Post image is from the exclusive set of images TFW2005 received from Paramount Studio. I am all for Director Del Tore to do the next Transformers movie. His action scenes are good especially the one on one battles. Like for example, Wheeljack vs. Soundwave in transformers prime. imagine if they spent those kind of resources on a script! I know the bots in AoE aren't on the same level in terms of rendering/model complexity of the first three movies. That said, I think AoE has the most natural looking movement in the entire series (so far). Things like Galvatron power walking and ducking under that building overpass to keep from bumping his head in HK, Optimus' and company reaction shots/emoting, etc. If slightly less complex models means I get more of that, in addition to more screentime for the bots and such while also getting stuff like the Knightship, I'll take that sacrifice. Someday, we'll get Cybertron for at least half a movie. Meh, all that and it still looks like a hand. Just keep copy-pasting a bunch of scrap-metal programming. And this, folks, is why we can't have a full CGI movie lol. Hmmm. If I take that to mean the knight ship was a bigger challenge than the driller from DOTM then perhaps they're focusing on the wrong things. I wasn't entirely sure the driller was worth the resources it required (which isn't to say it was wasn't cool- it was)- if this required even more than perhaps some of the other vfx issues start to make sense as well as action scenes I didn't think came close to the best in Rotf and Dotm. Don't get me wrong- I liked the knight ship. Is it me, or does the fact that the Knightship looks like a hand when it's upside down. I've often thought that too. I was kinda wondering if they were slyly hinting at something more maybe down the road. I loved the Knight ship parts of the film, and they need to do more of that in future films. For all they money these movies make it seems they could throw in more aspects like this in. Seeing the bots in more of their natural surroundings. But its more of a technical limitations to some extent too. A lot of processing power involved. That was a great video. That ship was truly fantastic to see onscreen in 3D. I hopefully they're generous enough to share more, specifically the Dinobots.